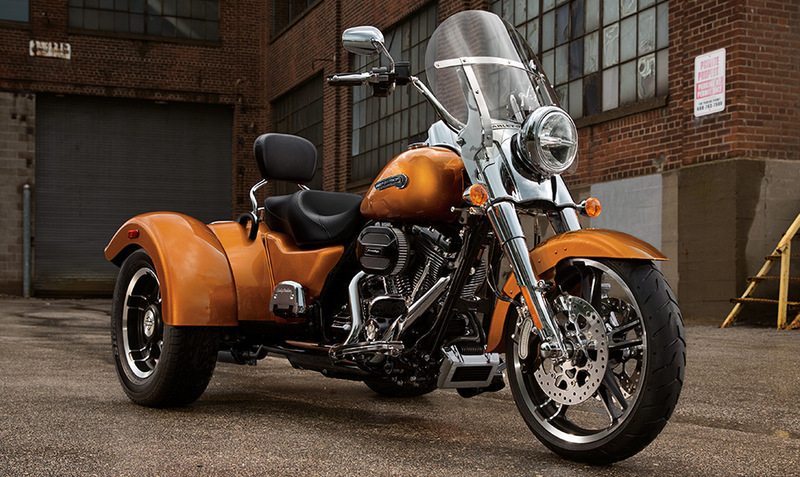 At the Harley-Davidson dealership meeting in Denver this morning, the company introduced eight new motorcycles for 2014. 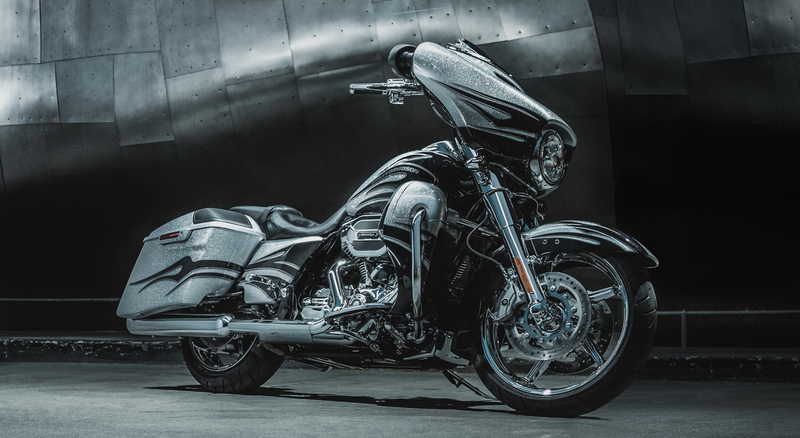 Proclaimed the largest new model launch in the company’s 110-year history, the eight new motorcycles feature improved power and braking performance, enhanced rider ergonomics, and styling updates. 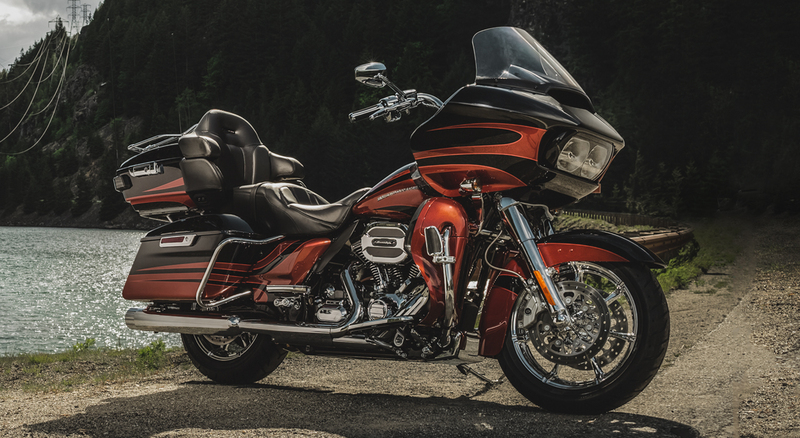 The eight new models are the Road King®, Street Glide®, Street Glide® Special, Electra Glide® Ultra Classic®, Ultra Limited, Tri Glide® Ultra, CVO Ultra Limited and CVO Road King®. Control: The motorcycles will pass faster, stop quicker and allow riders to see farther at night. Some models feature the new Twin-Cooled™ High Output Twin Cam 103™ while others get the new High Output Twin Cam 103™ powertrain – both with fuel injection. Reflex™ Linked Brakes with ABS (Anti-Lock Braking System) is new for all models and the new Daymaker™ LED is also standard on some models while others get new Dual Halogen lighting. The Linked braking, means braking with the front and rear wheels is synchronized and the system will automatically calculate the amount of braking that’s necessary under the existing conditions. Infotainment: The Boom! ™ Box infotainment systems feature voice recognition and touchscreen for music, GPS navigation and phone in motorcycling, with audio, Bluetooth® connectivity, text-to-speech technology, plus support for intercom and CB communications in a single module. 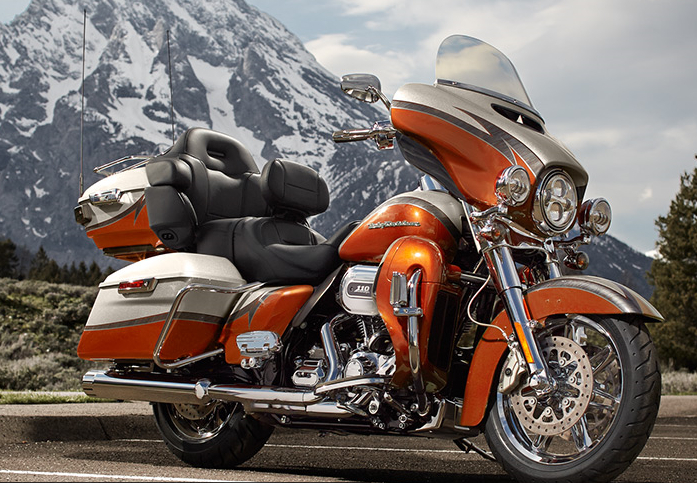 H-D integrated the vehicle information in a single electronic touch screen. There are five-way joy sticks on the left and right motorcycle hand controls for most of the system’s functions. Feel: Aerodynamics and ergonomics are improved – with a new Batwing fairing with splitstream venting, which reduces head buffeting and with wider and deeper seats and new back and arm rests. The motorcycle hand controls have been redesigned, and the number of dash gauges have been reduced from six to four — with temperature and oil pressure readouts moved to the electronic screen and the gauges made larger for better visibility. 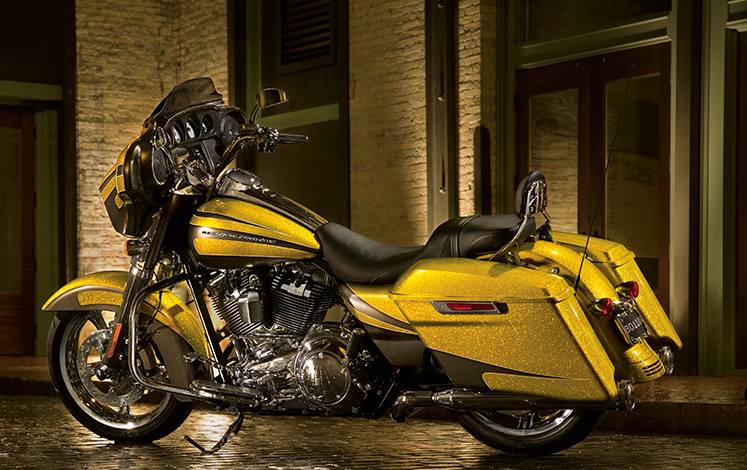 Style: The function of several components are improved such as the larger Tour-Pak® and saddlebags with convenient One-Touch latches, sleeker fenders, lighter cast aluminum wheels and intuitive hand control switches. Other changes in the 2014 lineup include anti-lock brakes on all five Sportster models, a new CVO Softail Deluxe that comes with a detachable windshield with GPS navigation, Daymaker LED lighting and detachable saddlebags. Also, the Twin Cam 103 engine is now standard equipment on the Street Bob and Super Glide Custom models. On the surface the changes look positive and bring H-D more in alignment with the competition. It’s peculiar that the motor company goes to great lengths to hype part of the “new” development process that now includes formal focus groups and events like motorcycle shows and music festivals, and simply chatting with customers! Huh? Is H-D marketing implying they didn’t have product focus groups prior? I’m looking forward to getting a look at the bikes at the 110th Anniversary in Milwaukee. I wonder how much difference the additional head cooling makes on the engine? The new Boom! ™ Box infotainment radio with improved connectivity and text-to-speech technology is a welcome update because the old radio was dated and in serious need of an update.